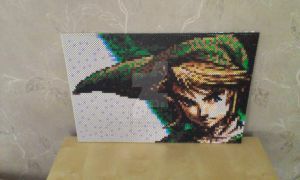 IS LINK! HE IS BEAUTIFUL! U HAVE WAY MORE COMMITMENT THEN I DO! oooooooooohhhh!!!! it is a great work!!!! congratulations!! You like 'The legend of Zelda' how I see. Another great work! Your style is just cool! This is phenomenal! The shear size is staggering! You are so talented! It is rare that I come across an art medium that I have not tried. My kids have done very simple shapes with those beads but never to the detail that your artwork shows! !Keep up the amazing work! Wow this is really impressive! 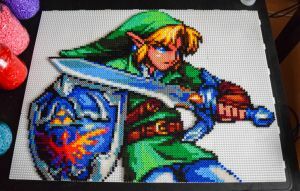 This is an amazing sprite, very well done!!! Are you putting a backing behind it before you hang it?? I find this very legendary !1!!!1! Wow thats great work !! Wow....this looks just.....Beautiful, So beautiful it's making me shred a tear ( XD not really ) But awesome work! This is incredible! How long did it take to put this together? This is great, love the lighting and pose. Superb use of colours. Wow that's big! Cool stuff! .o. I NEED ONE OF THOSE XD I love it!! !